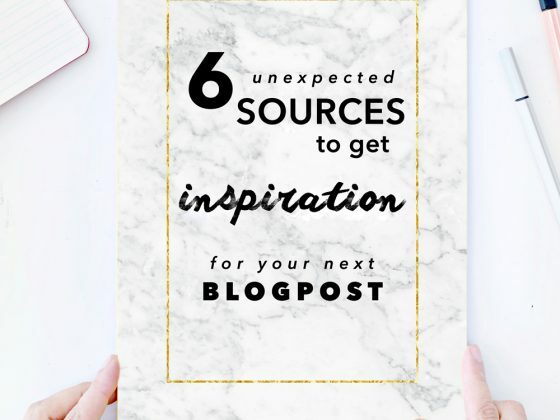 Are your ready for the most handmade DIY project ever? 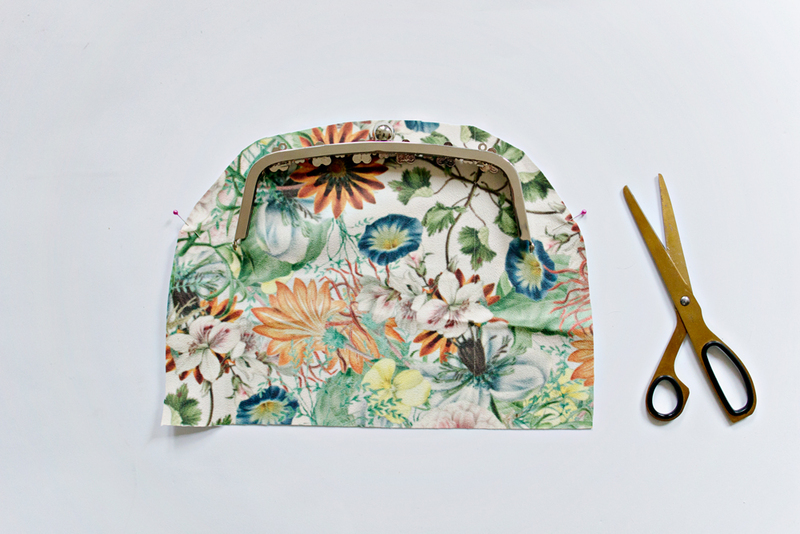 Because not only can you make your own frame purse, you can also design the inner and outer fabric yourself! 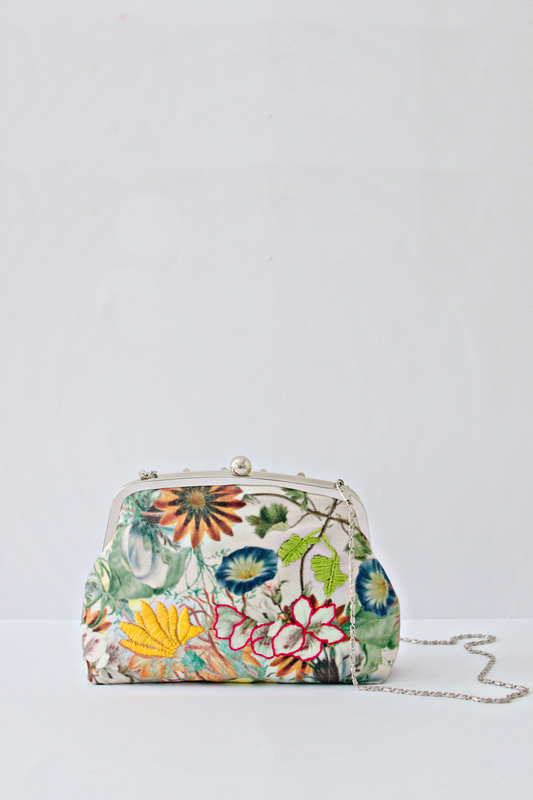 Which means that (apart from the frame) everything about this purse will be designed and made by you! 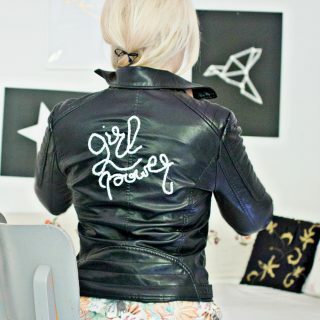 I am all for upcycling DIY projects and restyling and remaking things (I have about 3 vintage dresses at home, waiting to become my next project) but every once in a while it just feels amazing to make something from scratch. And not only make it, but also design it, wear it, use it and show it off!! 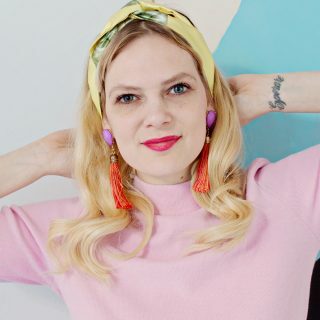 You can read more about the process and inspiration for my designs in the DIY Robe Coat project blogpost. After finishing the coat and wearing it as often as I could, I still had a small amount of fabric left over. And since it was getting warmer outside I couldn’t sport my handmade prints anymore. 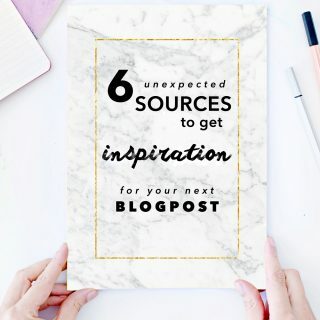 Solution: a purse that is suitable for anything and is also a good project to share with you! I decided to turn the faux suede fabric into a clip purse, because I always wanted to try making one, and opening a clip frame purse, is the perfect fancy way of showing off the lining fabric. 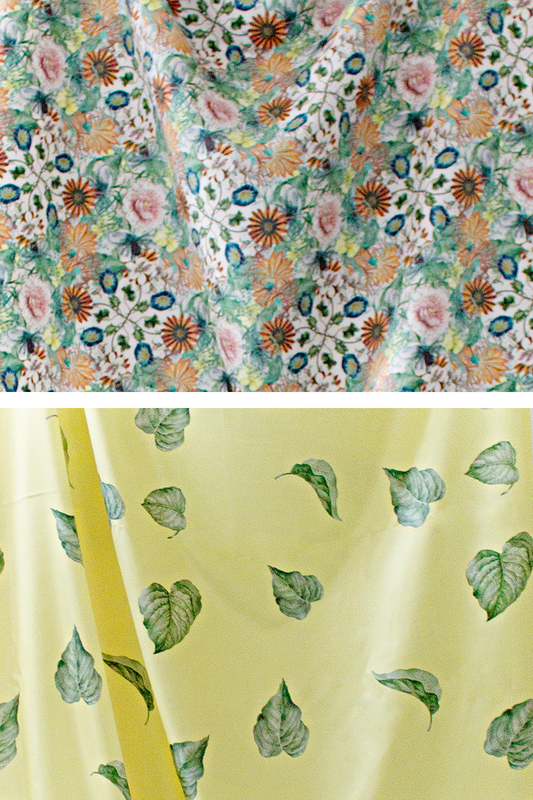 – Use the fabric print designs that I made and use in this tutorial. 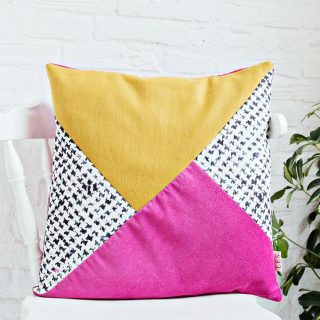 – Design your own fabric and make the ultimate handmade project. 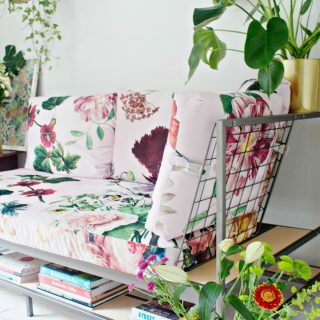 – Use your favourite store-bought fabric. 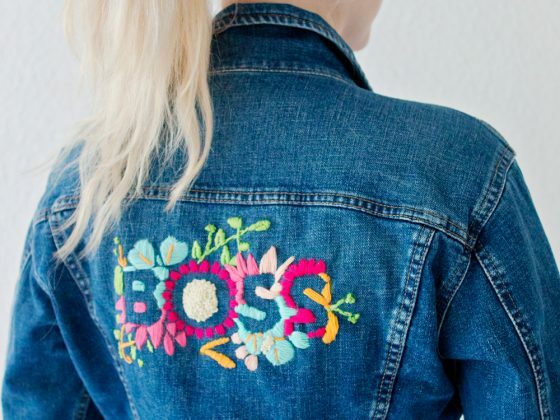 – Add an embroidery detail for an even more crafty project. 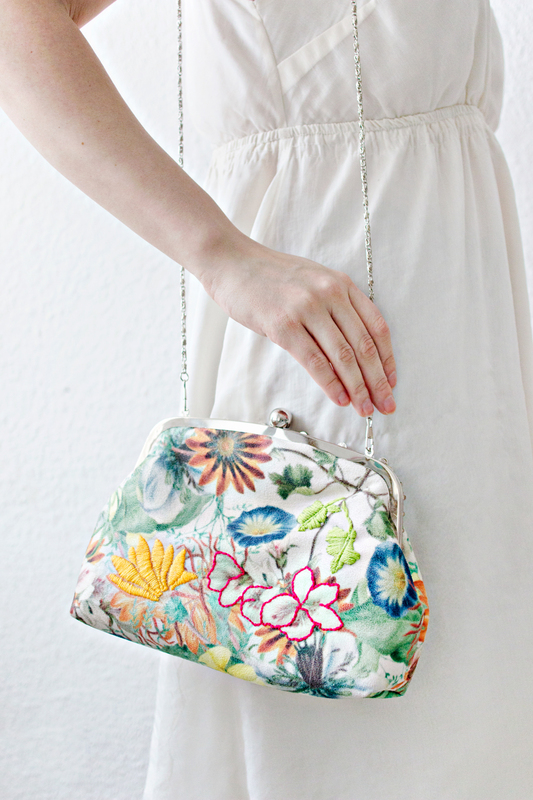 – Go tiny and make a coin purse, or go big and make a practical bag. – Place your faux suede fabric, right side up, on a flat surface. – Take your clip frame and place it on top at the top of the fabric. – Cut the fabric 2 cm on top of the frame as shown above. – Mark the end-point of the clip frame with a pin in the fabric. Measure 3 cm to the outside and pin another pin. Cut a line from the previously cut fabric to the outside pin. Repeat this on both sides of the fabric. – Decide the length of your purse and add 3 cm to the length size (for the bottom of the purse). 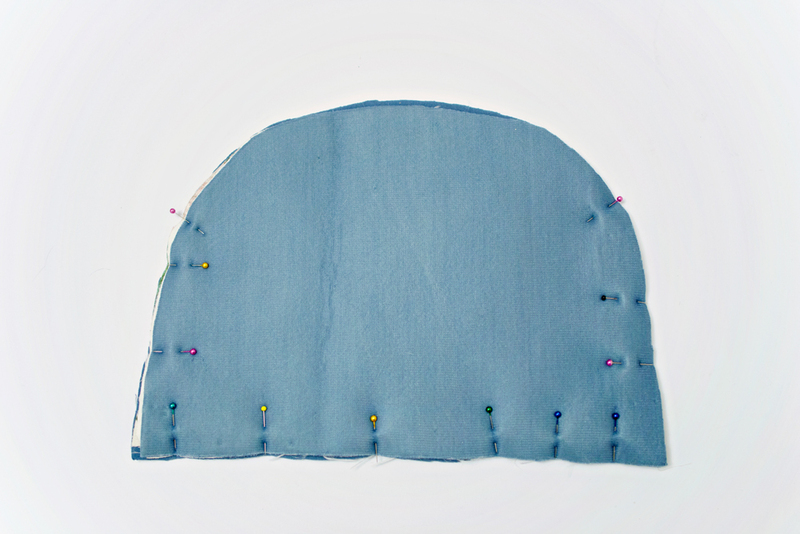 – Starting at the outer pin, cut the fabric downward in your chosen length. repeat this on the other side. – Cut the fabric in a straight horizontal line at the bottom. – Trace your cut fabric onto another piece and cut that piece out. You will now have the front and back outer pieces of your purse. Want to add a special detail? 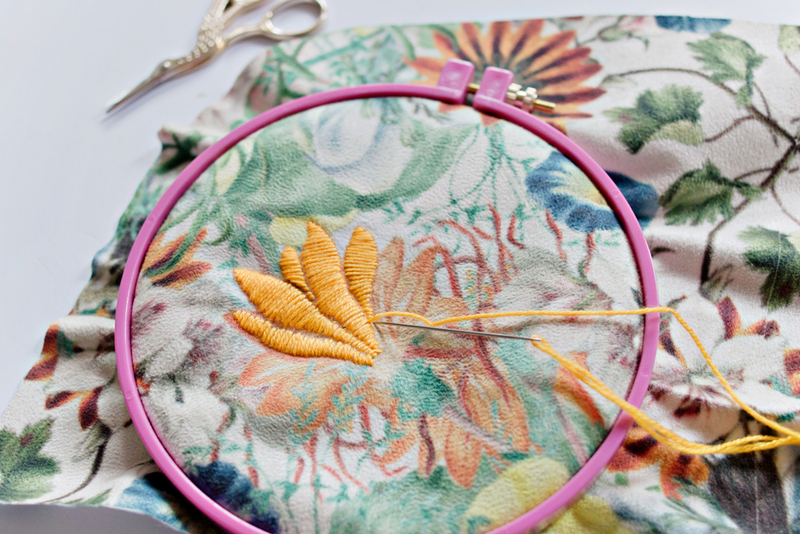 Embroider your fabric! 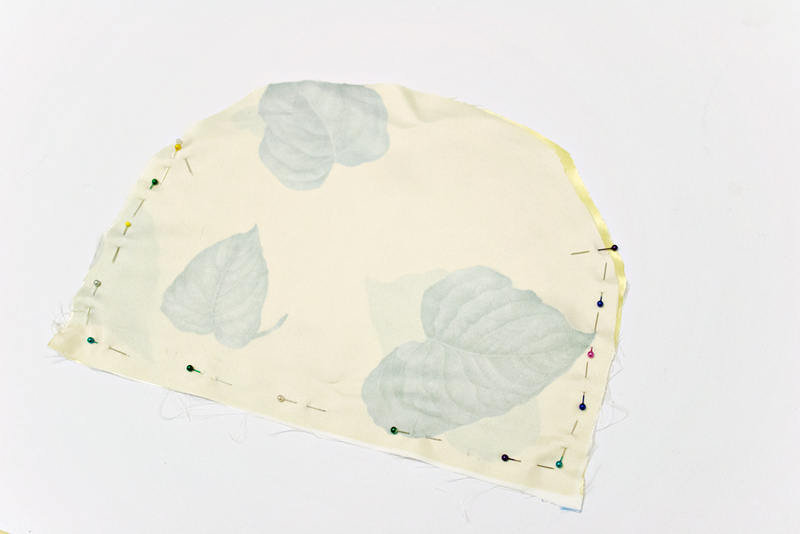 – Place your fabric in an embroidery hoop. – Tie a knot in your embroidery thread and thread the needle. – Starting from the back of the fabric, move your needle in and out of the fabric, following the print. – Repeat this until you have made a few embroidered details. 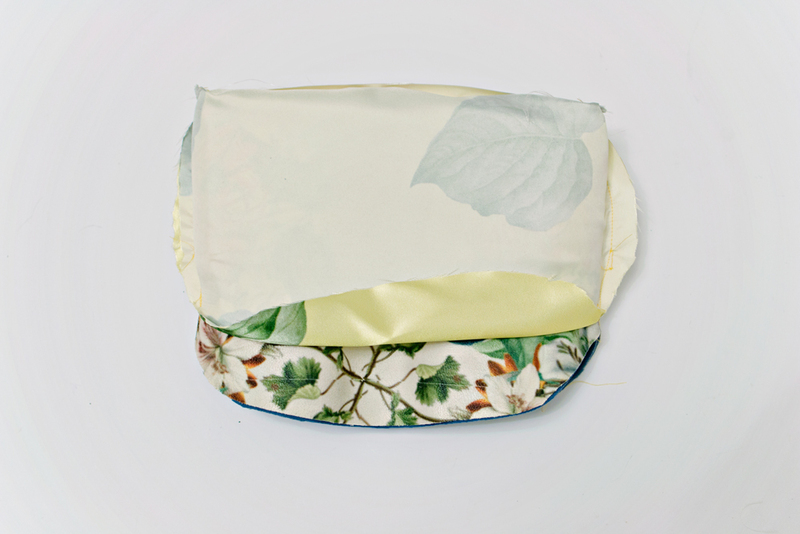 – Double your lining fabric with the right sides together. – Place the outer suede piece from step 1 on top of the double lining fabric. Trace the shape onto the lining and cut it out. – Pin and sew the two lining pieces together at the sides and the bottom. 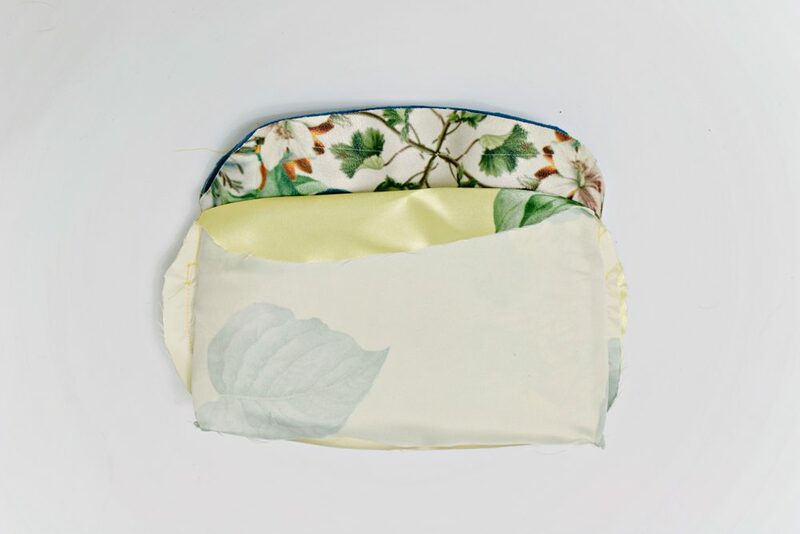 – Double your interfacing fabric ( I used neoprene instead of regular interfacing fabric) and place the outer piece of the purse from step 1 on top of the doubled interfacing. 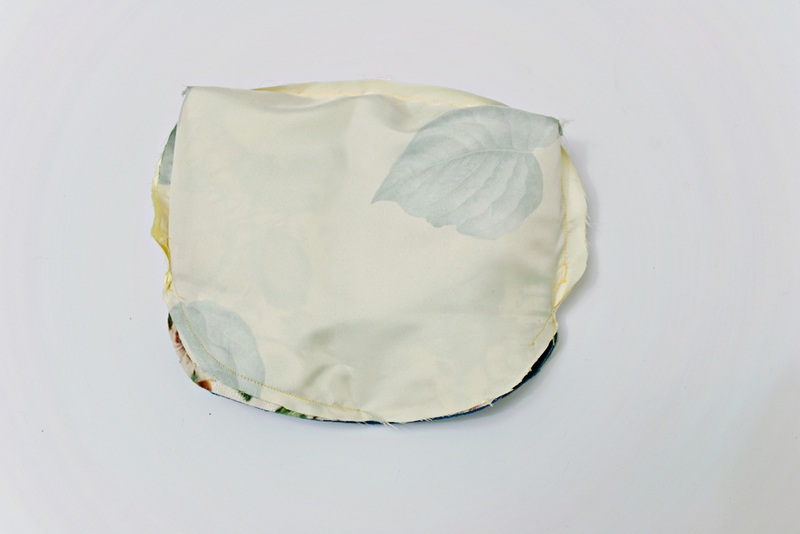 – Cut the shape from the outer fabric out of the two interfacing layers. – Place the two interfacing pieces on top of each other, and sandwich the suede pieces (right sides facing each other) in between. – Pin and sew the four pieces of fabric together at the sides and the bottom. – Fold the suede and interfacing part inside-out. – Take one bottom corner and flatten it (as shown above). Use a pin to keep it in place. – Sew the bottom corner with your sewing machine in a straight line. – Repeat this for the other corner. 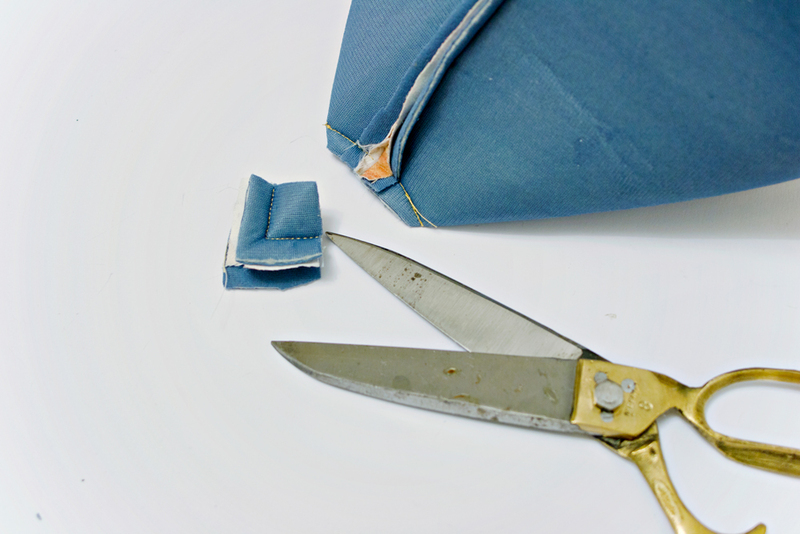 – Cut the excess fabric from the two bottom corners with your scissors as shown above. – Repeat step 5 & 6 for the lining fabric. – Fold the suede and interfacing part right-side-out. – Fold the lining piece right-side-in. – Place the suede and interfacing piece inside the lining fabric. – Make sure that all of the sewn lines are lined up. 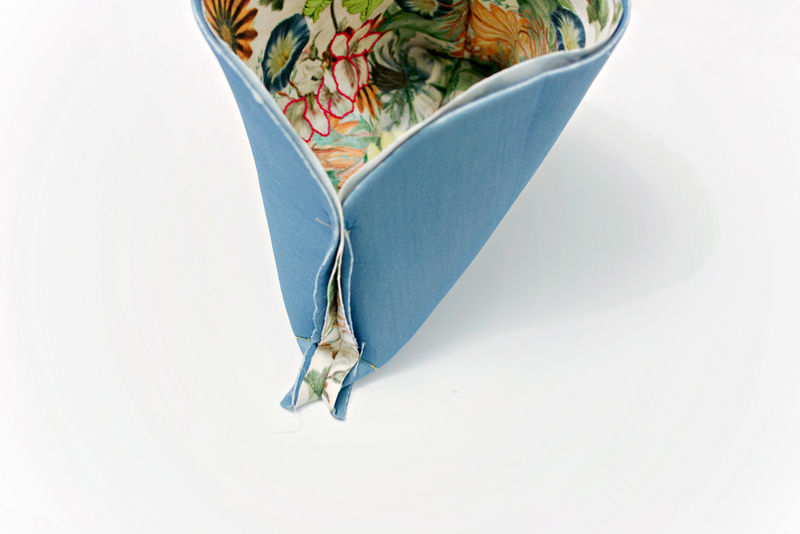 – Pin and sew one side of the top of the lining, interfacing and suede fabric together, repeat this by going all around the top of the purse, finishing by leaving approx. 4 cm left open. 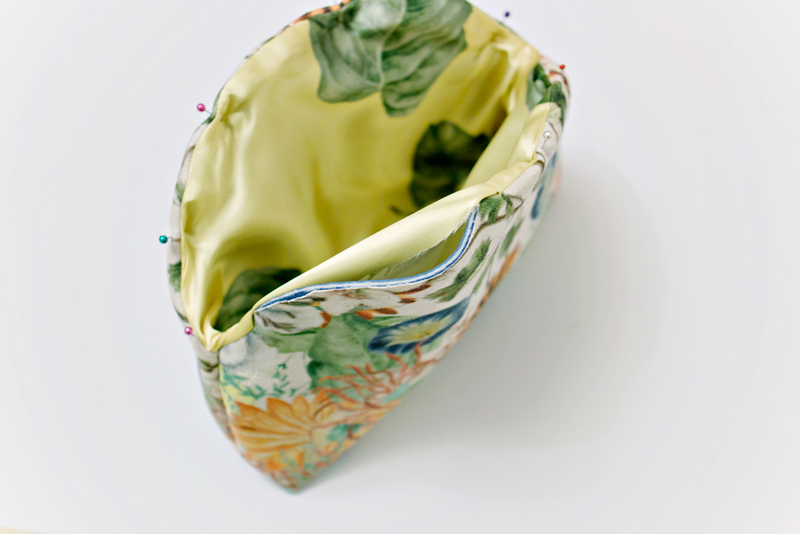 – Pull the entire sewn purse through the 4 cm opening at the top. 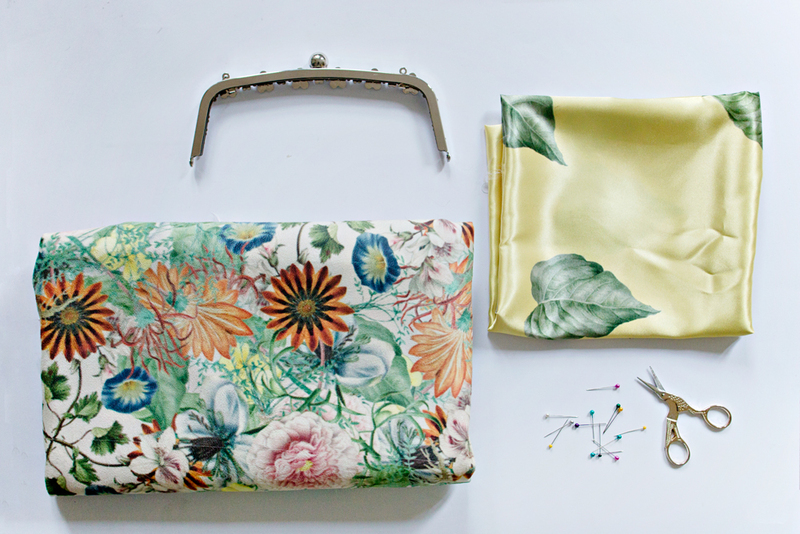 – Make sure that everything is aligned and pin and sew along the top of the purse, closing the opening and creating a crisp edge for the next step. 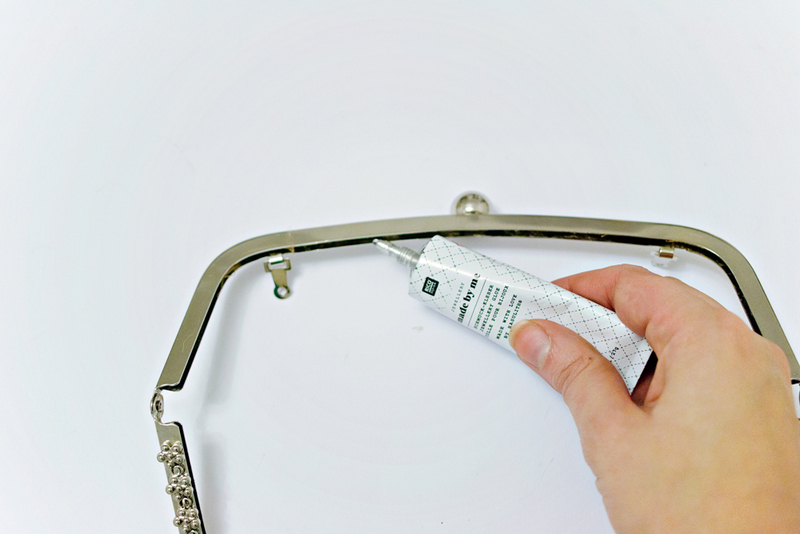 – Starting at one side press the top of the purse inside the groove of the purse frame. Repeat this on the other side, until you have pressed the entire top of the purse into the groove. And that’s it! 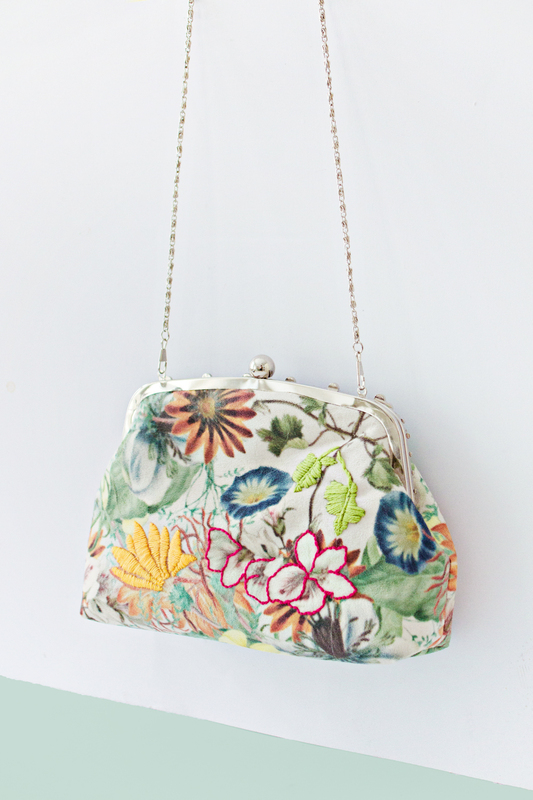 You now have your very own handmade clip frame purse! 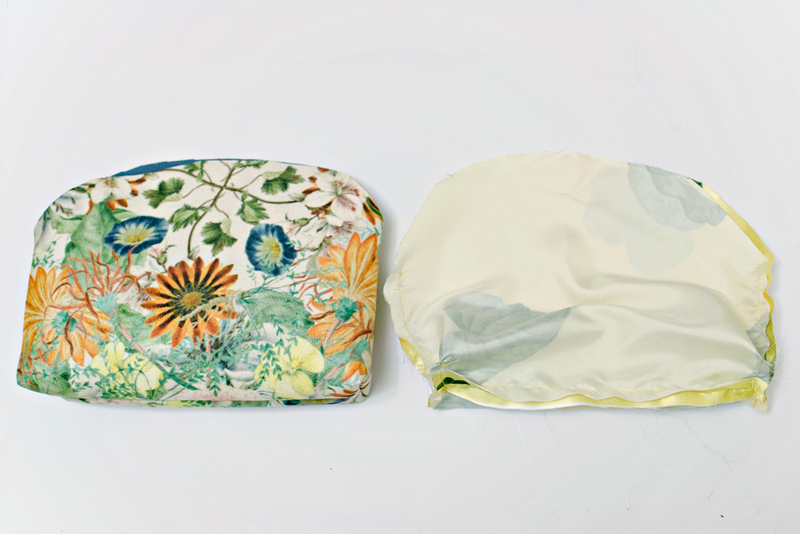 Do you have even more fabric left over, but not enough for an entire purse? No worries! 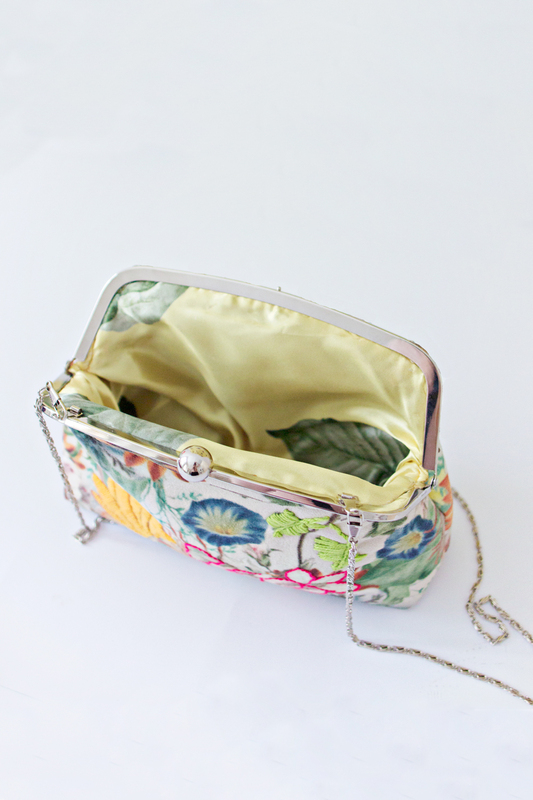 I also made an easy sewing DIY project for a zipper pouch, using left-over fabrics and textile: zipper pouch tutorial.